Tito Ortiz might be new to this whole manager thing, and he may not have made the right call in having star client Cristiane “Cyborg” Santos (Pictured) decline a contract offer from the UFC in favor of Invicta FC, but he sure does know how to keep Cyborg’s name in the headlines. On Saturday night at UFC 157 when Ronda Rousey and Liz Carmouche became the first females to fight inside the Octagon, guess who was sitting front and center soaking in the watershed moment? Immediately after the main event wrapped, imagine who was holding their own “press conference” backstage. If you answered Ortiz and Cyborg to both questions, you win the highly coveted pat on the back. Unfortunately for Ortiz and Co., UFC President Dana White claims the dynamic duo came up on the losing end when they inked with Invicta. He says the Brazilian missed the UFC boat because the ship has already sailed. 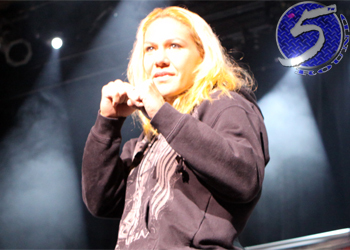 “Cyborg missed the boat,” White stated following the UFC 157 post-fight presser. “They can do whatever they want to do and play games. You over-negotiate sometimes. They’ve already over-negotiated. It’s gone, it’s over. During Ortiz’s impromptu media gathering, he said Cyborg wants to fight a few times at her natural featherweight class for Invicta, then challenge Rousey at a 140-pound catchweight contest in the UFC’s New Year’s Eve weekend event. So, what do you think about Tito’s agenda, Dana? “That means nothing to me,” White flatly replied. “[Expletive] is rollin’ here, Cyborg’s not a part of it. They can have as many press conferences as they want to have, or show up here in the back or do whatever they want to do. She had the opportunity to sign with the UFC, she chose not to. White didn’t slam the cage door shut on a potential super-fight between Rousey and Cyborg, but he did proclaim it would be the “Rowdy” one’s call if it comes to fruition. White reiterated the UFC is solely focused on building the bantamweight division for women. So if any ladies wants some, including Cyborg and Gina Carano (if she’s interested), they better be able to tip 135 pounds on the scale.